Here at Winners Inn Casino we want our players to have the best gaming experience possible. Our guests should never feel intimated to play any one of our exciting table games. Find all the help you could need in our intuitive table gaming guide. Winners Inn Casino has 5 Blackjack tables for your gaming excitement. Remember, we just want to show you a great time, so don’t hesitate to ask our employees for help. Here are a few of the basics of the game. Craps is an exhilarating game that anyone can play. It is often the source of bursts of cheers heard throughout the casino. Best of all you don’t have to be a high roller to play. Let us teach you this exciting game. Your questions are always welcome and our staff will do everything possible to show you a great time during your stay. In Blackjack, you are playing against the dealer. The object of the game is to come as close as you can to 21, without going over, and still beat the dealer. Remember, you don’t have to have 21 to win, all you have to do is beat the dealer. ​All numbered cards count for face value. Jacks, Queens and Kings are 10 and the Aces are valued at either 1 or 11, whichever produces the best hand. To begin play, the dealer will deal each player and himself two cards, one at a time, face down. The dealer will then turn one of his cards face up so its value is revealed. You may ask for another card ‘ called taking a hit ‘ by scratching, or pulling the edge of the card toward you. This will signal the dealer to give you another card. If this card causes your hand to total more than 21, you have busted and the dealer will take your bet. If you think your total is enough to beat the dealer, just tuck a corner of your cards under the money that you have bet. This indicates that you don’t want any more cards (you stand). ​The dealer is required to draw a card if his total is less than 17 or if he has a soft 17. A soft 17 means that the dealer holds an Ace plus one or more cards adding up to a total of 7 (In this example, the Ace counts as 1). ​Scoring is easy. If your total is 21 or less, and more than the dealer’s hand, you win. If the dealer’s hand is the same total as yours, it’s a stand-off or push, and you get your bet back. And, if you go over 21, you lose even if the dealer goes over 21. That’s the basics. Remember, here at the Winners Inn Casino, your dealer is always happy to answer any questions you have. The object of the game is to roll two dice, establish a point by rolling a 4, 5, 6, 8, 9 or 10, and then repeat the same number before rolling a seven (“Pass”). Players can bet on the shooter. Or, they can bet the shooter will roll a seven before rolling the point (“Don’t Pass”). The Pass and Don’t Pass areas are clearly defined on the Craps table layout or cover (see photo). In order to shoot the dice, you must make a bet on either the Pass Line or the Don’t Pass Line. Other players may place bets when the stickman says “coming out”. When you put your money on the Pass Line and the shooter rolls a 7 or 11 on the come out roll of the dice, you win. However, if the shooter rolls a 2, 3 or 12 (Craps), you lose. If any other number comes up (4, 5, 6, 8, 9 or 10), it becomes the shooter’s point. The shooter must roll that point again, before a 7, in order for you to win. If the point is rolled, you will be paid the amount of your Pass Line bet. After a point has been established, you may make a Come bet. This area is also clearly defined on the Craps layout. You may bet this any time after the come out roll. When you bet the Come Line, you win if the next roll is a 7 or 11. You lose if the next roll is a 2, 3 or 12. If any other number is rolled (4, 5, 6, 8, 9 or 10), your bet is moved to that number. Should a 7 roll before your number, you lose. However, if your number rolls before a 7 is rolled, you win the amount you bet on the Come Line. After a point has been established, you may make a Don’t Come bet. This area is also clearly defined on the Craps layout. You may bet this area any time after the come out roll. When you bet the Don’t Come Line, you win if the next roll is a 3 or a 12. If that next roll is a 2, it is a standoff or push. Should that next roll be a 7 or 11, you lose. If any other number is rolled (4, 5, 6, 8, 9 or 10), it becomes your number. If that number rolls before a 7, your bet loses. However, if a 7 rolls first, you win even money on your Don’t Come bet. This is a one-roll bet and may be bet at any time. If you bet the Field and a 3, 4, 9, 10 or 11 rolls, you win the amount you have bet. However, if a 2 or 12 rolls, you win twice the amount bet. Should any other number roll (5, 6, 7 or 8), you lose your bet. On the outside corners of each side of the Craps layout you will see a big red 6 and 8. On this bet you are wagering that a 6 or 8 will roll before a 7 rolls. If it does, you win even money. You may put this bet down or take it off any time you choose. PASS LINE: When you put your money on the Pass Line and the shooter rolls a 7 or 11 on the come out roll of the dice, you win. However, if the shooter rolls a 2, 3 or 12 (Craps), you lose. If any other number comes up (4, 5, 6, 8, 9 or 10), it becomes the shooter’s point. The shooter must roll that point again, before a 7, in order for you to win. If the point is rolled, you will be paid the amount of your Pass Line bet. COME: After a point has been established, you may make a Come bet. This area is also clearly defined on the Craps layout. You may bet this any time after the come out roll. When you bet the Come Line, you win if the next roll is a 7 or 11. You lose if the next roll is a 2, 3 or 12. If any other number is rolled (4, 5, 6, 8, 9 or 10), your bet is moved to that number. Should a 7 roll before your number, you lose. However, if your number rolls before a 7 is rolled, you win the amount you bet on the Come Line. DON’T COME: After a point has been established, you may make a Don’t Come bet. This area is also clearly defined on the Craps layout. You may bet this area any time after the come out roll. When you bet the Don’t Come Line, you win if the next roll is a 3 or a 12. If that next roll is a 2, it is a standoff or push. Should that next roll be a 7 or 11, you lose. If any other number is rolled (4, 5, 6, 8, 9 or 10), it becomes your number. If that number rolls before a 7, your bet loses. However, if a 7 rolls first, you win even money on your Don’t Come bet. FIELD: This is a one-roll bet and may be bet at any time. If you bet the Field and a 3, 4, 9, 10 or 11 rolls, you win the amount you have bet. However, if a 2 or 12 rolls, you win twice the amount bet. Should any other number roll (5, 6, 7 or 8), you lose your bet. 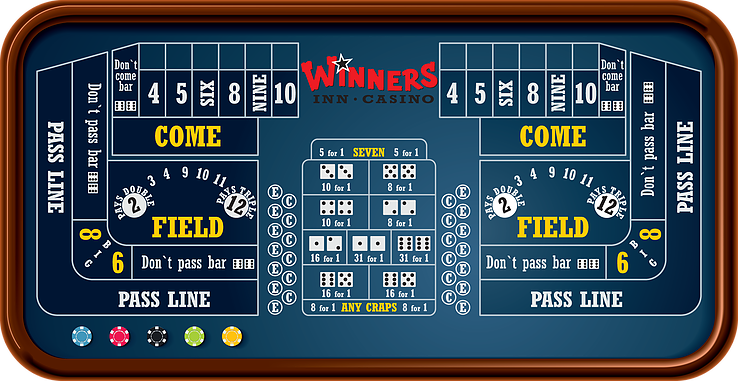 BIG 6 or 8: On the outside corners of each side of the Craps layout you will see a big red 6 and 8. On this bet you are wagering that a 6 or 8 will roll before a 7 rolls. If it does, you win even money. You may put this bet down or take it off any time you choose. On this bet you are wagering that a 2, 3, 11 or 12 will roll on the next toss of the dice. Betting the Horn is a fun bet that pays high odds if you win. If a 2 or a 12 is rolled, you win 30 to 1. If a 3 or an 11 is rolled, you win 15 to 1. This is a one-roll bet. You are wagering that the next time a 4, 6, 8 or 10 is rolled, it will be rolled as a pair of 2s, 3s, 4s or 5s. Place your bet on the 6 and 8 area for 9 to 1 odds or the 4 and 10 area for a 7 to 1 payoff. This one-roll bet can also be made at any time. If a 2, 3 or a 12 is rolled, you win 7 times your bet. This is a one-roll proposition and you can bet on any roll. If an 11 is rolled you win 15 times your bet. After establishing a point by rolling a 4, 5, 6, 8, 9 or 10, you can bet any amount up to double the amount of your original bet on that number. If a 4 or 10 is rolled, you collect 2 to 1; if 5 or 9 come up, you get 3 to 2. A roll of 6 or 8 pays 6 to 5. Odds Bets can be removed any time before a roll. These are much the same as Odds Bets, except that instead of establishing a point, you choose the number. Win 9 to 5 on 4 or 10, 7 to 5 on 5 or 9 and 7 to 6 on 6 or 8.